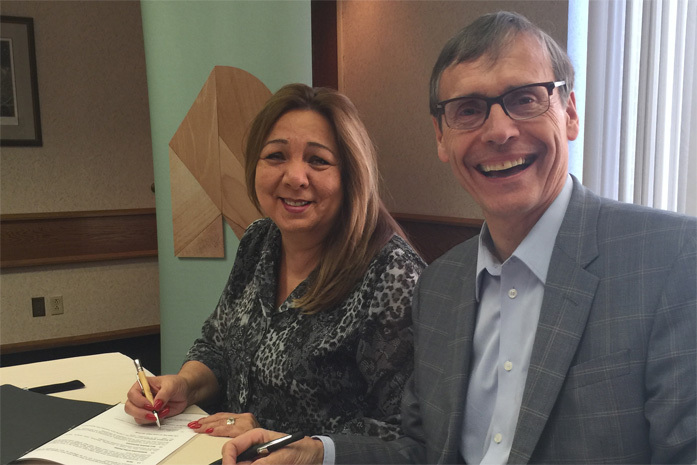 On December 18, Resolute signed a Memorandum of Agreement (MOA) with Chief White Cloud of the Lac des Mille Lacs First Nation (LDMLFN) to identify and pursue new economic opportunities. It’s the most recent of several agreements and partnerships we’ve entered into with First Nations communities in our areas of operation. This latest MOA outlines a basic protocol for ongoing economic cooperation. It also looks to develop a better understanding of each other and our mutual interests while building an enhanced appreciation of our respective cultures. The MOA lends some shape to what has already proven to be a fruitful relationship. In fact, Resolute and LDMLFN have cooperated on forest management and shared economic opportunities for more than 2 decades. As an active participant in the development of forest management plans, LDMLFN has ensured the interests of its community are well represented, and over the years, members of the community have been engaged in a number of contracts for forest-based economic opportunities. The First Nation has also held contracts associated with the provision of services associated with our facilities in Northwestern Ontario. Community members have been involved in the management of the Black Spruce and Dog River-Matawin forest. Members of this First Nation are also actively engaged in road maintenance and construction, harvesting activities and yard services for our facilities in Northwestern Ontario. The total value of these contracts is approximately $6 million. The Lac des Mille Lacs First Nation and Resolute have a long and successful history working together and we are confident that under the leadership of Chief White Cloud and her council, we can expand our relationship even further.